Q. Where can I find biblical commentaries? The first step to finding the biblical commentary of your choice is to do a search on the library catalog. You can do this from any internet browser, or from our catalog computers. There are two public catalog computers on the first floor of the library and one on both the second and third floors. You can either search by title (e.g. The Gospel of Luke) or set (e.g. Ancient Christian Commentary on Scripture). General keyword/subject searches are usually conducted by typing the biblical book title followed by the word "commentary," (e.g. Jonah commentary, or Gospel of John commentary). 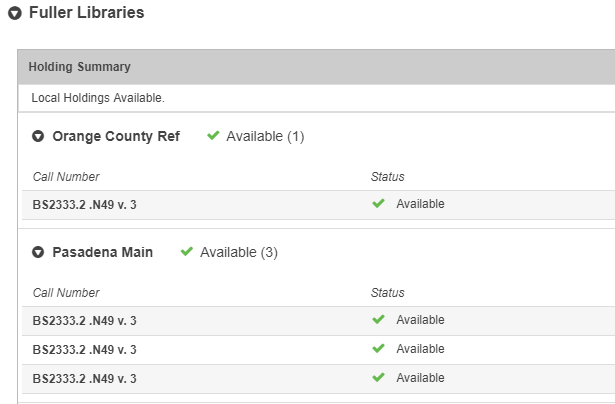 Once you find a desired commentary in the catalog, you can determine the location(s) of all copies by clicking on the title and accessing its detailed record. Please note that in WorldCat Discovery (the default library catalog), only one copy of a title will appear in the initial results page, and that title may not represent all copies' location, (e.g. not all copies of this title are in Orange County). The detailed record will display all copies of the title owned by Fuller in a "Holding summary," under "Fuller Libraries" and "Availability." Here you will see the campus location, shelving location (main, reference, storage, etc. ), call number, and availability of each title for check out. On the Pasadena campus, the most complete collection of biblical commentaries is available (for library use only) in our reference collection, located in the Depree Reading Room to the left of the library entrance and front desk. When present, additional copies are added to the main collection on Basement A and can be checked out. Some older commentaries can also be requested from storage at the front circulation desk and are available for check out. Regardless of their shelving location, all print commentaries are organized according to their library of congress call number, usually starting with the prefix BS (Biblical Studies). Unless you are very familiar with the cataloging system, it can be challenging to find particular volumes without the aid of the catalog search method outlined above to retrieve a specific call number. Note: At the bottom of the page is a downloadable file listing the specific call number range of all individual biblical books along with some recommenced commentary sets. Please note that it is possible some historical commentaries (especially patristic) may be cataloged under BR, and some historic commentaries of denominational significance may be cataloged under BX. If you cannot locate a desired commentary by browsing BS, consult the catalog to locate possible alternate locations. While relatively small, we also have a growing collection of eBook commentaries available. Please follow the link below to read more about how to locate and access eBook commentaries directly through the library catalog!